I was recently invited to take a look at UK shoe website Brantano. The site has a huge selection of 'Shoes for all the family' as well as bags and accessories. They stock a wide selection of brands too including Nike, Adidas, Clarks, Sketchers and Rocket Dog as well as Brantano's own brand of shoes and accessories. As the weather is starting to cool down I thought I would show you my favourite Winter Boots from the site to give you some inspiration for any upcoming shoe shopping trips you may have planned. These are my idea of "cowboy" boots, I love the sandy shade and that they already have that lived in look of well loved or vintage boots. The small heel means that these should be very comfortable as are most Clarks boots. They would be perfect for everyday casual wear. These black suede heeled shoe boots are great for a smart casual look during the colder months. They give you height but with comfort and will go with anything. I'm definitely going to get myself a pair like these as I always choose comfort first and Clarks heels are always the most comfortable. The medium heel and slight platform are perfect for tall ladies like myself. These boots are almost a black version of the first pair, with a bit of a western look to them. The heel is a little taller for anyone who likes an extra bit of height on their casual shoes. I can imagine these looking really nice with a floral print dress layered up for the cold weather. These Emilio Luca boots are a heeled Chelsea boot with a twist in that they have a buckle detail on the side which adds something a little different to a trend that's been around for a while now. I can see these being a great day to night boot, the heel is small enough that they could be worn for walking around during the day or for heading to a gig or out for drinks in the evening. The Emilio Luca range has some great price points too. Lastly, these Clarks boots have been a recurring style the past couple of Winters. These would be so great for frosty days as they rise a little higher up on the leg than an ankle boot so you could add some thick socks for extra warmth and comfort and they have a textured sole which is an absolute essential for icy weather. The tan colour means they would go with everything and I have actually tried these on myself and they are like walking on a cloud. Not a bad price for such a high quality boots either. Do any of these styles appeal to you? Have you bought your Winter boots yet? The middle black pair are very cute! Same here! Can't deal with heels at all, wedges I can just about manage! 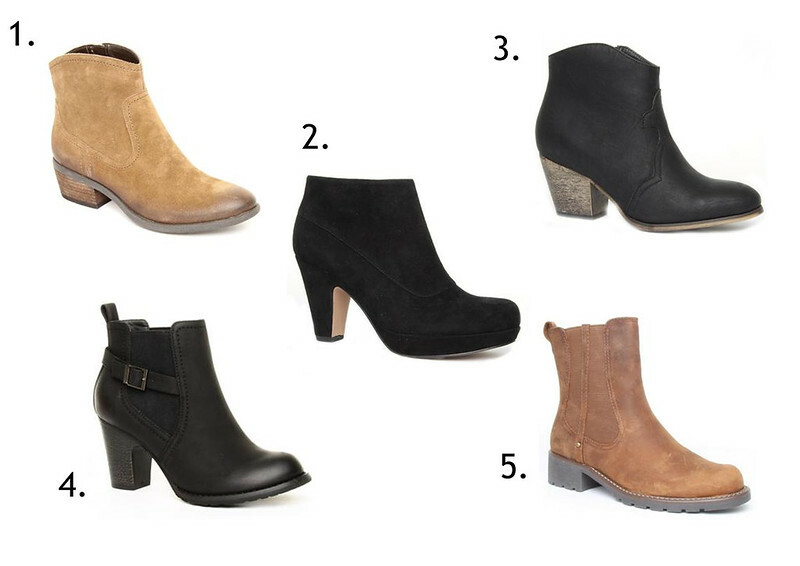 #1 and #5 are super cute, but then I am in the market for a pair of brown ankle boots atm so my tastes are a bit skewed. All are great choices. I practically live in my brown ankle boots, best money I ever spent on footwear! Those are gorgeous Rincy! That's my kind of heel and I bet they go with everything! Thank you Jane! I think ankle boots suit me better, although when it gets really cold I do like ones that come up a bit higher! I have a pair similar to #2 above and I love them! They are so comfortable yet look quite dressy. the 1st Suede Shoes really look nice & cute....i think they will perfectly suit my tight bottoms this winter!!! That black high heel shoes ....so cozy..wanna grab them !!! So nice collection of women wedges ....wanna have them all ! !